Ireland is a very superstitious country and they believe in many things. Saints are especially important here, with many worshiped and prayed to, depending on what they are known for. 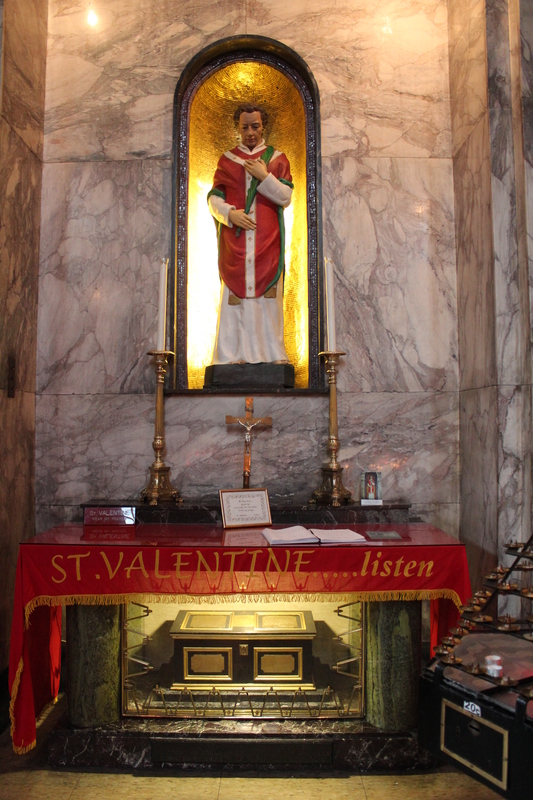 St. Valentine, the patron saint of love was Irish, and after being executed in Rome and buried there, many years passed before an Irish priest managed to bring his remains back to Ireland where they were buried under the Whitefriar Street Church in Dublin. Believers flock to this shrine daily, but more than anything on February 14th, to be blessed with love and marriages they may have, or for those looking for love; a blessing that love will come along soon. I am not sure whether I believe that this shrine helps people meet their soul mate, but if I end up meeting someone soon I guess I will change my tune and become one. So, what are you waiting for St. Valentine!? I do however like the faith people have in believing in something higher than themselves; and by visiting this shrine I did feel more positive after being there that good things will happen in future. I guess that is the main thing really. It may not be that St. Valentine blesses you to find love as many believe. Maybe he just inspires those who are looking to feel hopeful and more positive about it, which in turn helps them create it in their own lives? Which is something important in itself. Toni! You were in Whitefriar St Church but you missed my grandmother’s friend Jude (that’s St Jude to you and I, patron saint of lost causes). My brother’s then girlfriend (now wife) was travelling Asia circa 15 years ago and no one had heard from her in 3 weeks (we’re just at the cusp of widespread email/web access at this stage). My elderly Nana took 3 buses across Dublin to go “and tell Jude to sort it out”, and then back home. We were furious with her for going so far on her own but heard from my sis in law the next day…. How’s that for superstition!? That is insane! I did see at Jude there. There were so many saints in this church it was mental. Such a pretty place though!